Disable Java NOW or your PC (or Mac) could be hijacked or worse! The internet has been spreading the news of a vulnerability in Java’s latest version (v1.7) that allows an email/website/advert/facebook-spam to download AND install full programs on your computer without your knowledge. It is for this reason we too are spreading the message that YOU (and your friends) should DISABLE JAVA NOW to be safe. Keyloggers- stealing passwords and monitoring what you type in chats, emails, whilst shopping etc. Trojans – allowing the hackers to take control of your computer, steal files and photos or delete valuable information. Malware – allowing the hackers to spam the living days out of you with popups, fake ads and other annoyances. Scareware – fake anti-viruses that ask you to pay to fix your system whilst slowing your machine down. In Firefox: Press Firefox button -> Add-ons, go to Plugins and click the “Disable” button next to anything named “Java”. In Chrome: Type in: “chrome://plugins/” into the address bar (no speech marks). 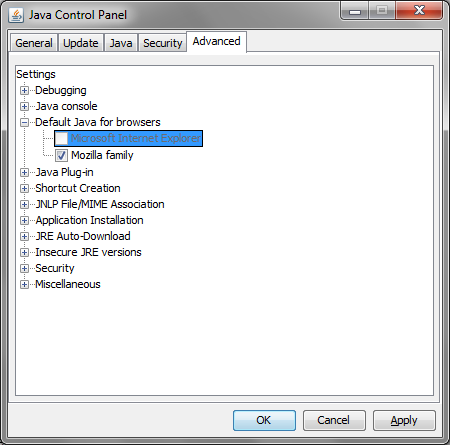 Scroll down to Java and click disable. Please do so now as to avoid any unnecessary annoyances and problems in the future. Follow or like us for more information on when it’s safe to update and re-enable Java following a patch release.